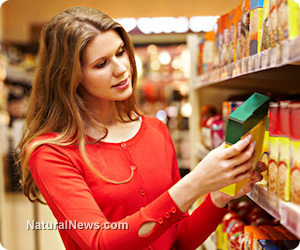 (NaturalNews) Are you confused about food label claims and what they really mean? That's part of the strategy of the global food giants, of course: confuse you with so much noise that you give up trying to make sense of it all. The USDA certified organic certification process does not test for heavy metals. Foods that are very high in lead, arsenic, cadmium, mercury and even aluminum are openly allowed to be labeled USDA certified organic. Just because a food is certified non-GMO doesn't mean it is organic. Even conventionally-raised crops such as corn, soy and canola can be certified non-GMO if they are grown without genetically engineered seeds. There are several snack chips on the market right now which use non-GMO ingredients grown with chemical pesticides. The phrase "All Natural" is not regulated in any way by the FDA. Any foods, including foods made with artificial colors, chemical sweeteners, chemical preservatives and GMOs, can be labeled "all natural." "All natural" is the trick used by large food corporations to try to mislead consumers into thinking their junk food products are somehow organic. The FDA currently allows foods containing up to 0.5g of trans fats per serving to claim ZERO grams of trans fats per serving. The FDA, you see, has been completely hijacked by food and drug corporations, and they have convinced the FDA to allow food labels to blatantly lie to consumers about what the food really contains. Everywhere else in the world, 0.5 does not equal zero. Even in high school math class, it's rounded up to one. But at the FDA, 0.5 somehow means zero. There are many foods, superfoods and even nutritional products currently claiming to be "non-GMO" but failing to provide any certification of that status. A company that self-proclaims its products to be "non-GMO" is most likely trying to pull a fast one on you unless it can back up that claim with certification. Only certified non-GMO means something. The next time you see a label that claims "non-GMO," ask yourself, "Certified by whom?" "Where's the proof?" Beware of GMOs in gluten-free foods. Because gluten-free foods are often based on corn, they are usually made with genetically modified corn containing BT toxin, a deadly insecticide. Avoid gluten-free unless it's also certified non-GMO. How much are they allowed to contain? "there aren't specific tolerance levels in the USDA organic regulations for GMOs," says the USDA. "National Organic Program policy states that trace amounts of GMOs don't automatically mean the farm is in violation of the USDA organic regulations. In these cases, the certifying agent will investigate how the inadvertent presence occurred and recommend how it can be better prevented in the future. For example, they may require a larger buffer zone or more thorough cleaning of a shared grain mill." Even though certified organic foods can still contain trace levels of GMOs, they are still far healthier for you than conventionally-grown foods, by the way. An increasing percentage of "organic" foods, superfoods and raw materials used in nutritional supplements are being imported from China. Natural News has found that these raw materials are consistently higher in heavy metals than competing products grown in North America. But because they are significantly lower in case, they are being increasingly used in nutritional products or sold at health food stores after being labeled "organic." Organic certification standards openly allow organic farms in China to grow produce in fields that are heavily polluted with cadmium, lead and mercury. There is no limit on the heavy metals levels in soils used to produce USDA certified organic foods. The FDA does, from time to time, conduct food contaminant tests on imported foods. However, the FDA does not publish or set any official limits on heavy metals in imported foods. Usually, when the FDA does find metals in foods (such as arsenic in rice), it declares the contaminant "too low to cause short-term health risks" while blatantly ignoring the long-term health risks. As long as the food is dead and not carrying e.coli or salmonella, there is almost no food too polluted for the FDA. Some products sold today are being described as "organic" when only a fraction of their ingredients are organic. This does not qualify a product to be called organic. Unlike the phrase, "all natural," the term "organic" is highly regulated by the federal government and carries a specific meaning. The mere presence of organic ingredients in a product is not sufficient to be able to claim the entire product is organic. Interestingly, even if ALL the ingredients used in a product are certified organic, the product itself still needs to be separately certified to be accurately called "organic." By the way, sometimes the cleanest product in a particular category is not the one that's certified organic, as we discovered in our heavy metals tests of chlorella superfoods. Look on the ingredients labels of "low calorie" foods or beverages, and you'll almost always find sucralose, acesulfame potassium, saccharin, aspartame or other chemical sweeteners. The presence of such chemical sweeteners is almost ubiquitous on foods sporting the "low calorie" label. And yet "low calorie" does not mean it's healthier for you in any way whatsoever. In fact, low-calorie foods such as diet sodas can still contain extremely damaging ingredients such as phosphoric acid, a potent chemical that can eat away your teeth and bones. What is the ultimate food, then? The ultimate commercially-available food would be certified organic, certified non-GMO, grown in your local country, certified Kosher and lab tested to be very low in heavy metals. But if you just grow it in your own garden, you don't need all those labels and certifications in the first place. You've got real food right from your own yard. That's why I encourage everyone to grow what you eat and eat what you grow. The answer to pollutants, GMOs, pesticides and heavy metals in foods is found when you get on your knees and put some seeds in the ground. Everything else in the marketplace -- including quadruple-certified premium food -- is vastly inferior to food you grow yourself.